Degyal Rinpoche aka Kunkhyen Etaraja (Tib. ཨེ་ཏ་རཱ་ཛ་, Wyl. e ta rA dza), Pema Dewé Gyalpo (Tib. པདྨ་བདེ་བའི་རྒྱལ་པོ་, Wyl. pad+ma bde ba'i rgyal po) or Tsultrim Lobsang Jangchup Pelzangpo (1873-1933) was one of the thirteen principal disciples of Dudjom Lingpa. He established the Namkha Khyung Dzong Monastery and its community of practitioners, in the area of Mount Kailash, in Western Tibet, and made Tröma Nakmo central to their practice. He achieved rainbow body at the time of his death. Degyal Rinpoche was recognised as an emanation of Ananda, of Thönmi Sambhota, of Vairotsana, of Drapa Ngönshe (teacher of Machik Labdrön) and of Terdak Lingpa. Elder son of a family belonging to the Mukpo Dong bloodline, Degyal Rinpoche was born in 1873 at Serta, Golok (Eastern Tibet). It is said that his behaviour was different from the other children and that he could keep for a long time a deep concentration. Along with the Mahamudra, the Six Yogas of Naropa from teachers like Lama Kunzang and Pema Dutsel Rinpoche. Practising with great diligence, it is said that he met lamas and deities in pure vision and visited the Buddha fields. From 10 to 12, he studied in particular the Bodhicharyavatara, the Prajnaparamita and the Yönten Dzö with Khen Lama Chödrak. At the age of 13, he took the novice vows with Shukgang Lama Thegchok Tenzin, who gave him the name of Tsultrim Lobsang Jangchup Pelzangpo. Soon afterwards, Shukgang Lama Thegchok Tenzin explained to the young monk that his root guru from the past lives was Dudjom Lingpa and advised him to continue his studies and practice under his guidance. As soon as Degyal Rinpoche heard the name of the great tertön, his thoughts suddenly stopped and he felt a spontaneous devotion towards him. Along with his maternal uncle, he went to the upper Do valley where lived Dudjom Lingpa in the hermitage of Dartsang Kalzang Gompa but, at the time he reached it, the great tertön was still in retreat for two weeks. Degyal Rinpoche was demoralized. Yet, after fifteen days, he could meet him. A that instant, it is said that "he saw the five aspects of Tröma Nakmö in the steam which billowed from his cup of tea, in the midst of rainbow lights". Having been accepted as a disciple by Dudjom Lingpa, he received from him all the empowerments, transmissions and instructions related to the Dudjom Tersar four dharma cycles, which he studied and practised diligently. In 1904, Dudjom Lingpa left this world after having announced his intention to open the gate of the sacred land of Pemakö. A group of disciples, including Degyal Rinpoche and Ling Lama Chöjor Gyatso, went to this hidden place and discovered the new incarnation of their teacher, Dudjom Rinpoche, who was only three years old at that time. The child recognised them and called each one by his name, using the Golok dialect he had not been taught. After one month in Pemakö (the part in Kongpo), Degyal Rinpoche left for a pilgrimage to Central Tibet. He visited the sacred places in Lhassa and around, meditated in caves and hermitages and had many mystical experiences. Degyal Rinpoche kept moving as fas as Upper Tibet with a handful of followers (Gonpo Tashi, Khusho Ajam, Thinley Chöpel and Tarna Lama). When he approached Mount Kailash, he prostrated himself all along the path, regardless of the pain in his legs. At the foot of the sacred mountain, he remained secluded for 3 years in the “Elephant cave”, well-known for having been a meditation place of Guru Rinpoche. After his retreat, he spent 5 days to write a commentary of the Sherik Dorje Nӧnpo Gyü tantra at the request of his disciples. Afterwards, he stayed 2 years long in another cave located in the west side of Manasarovar lake and managed to print the Neluk Rangjung tantra along with the Sherig Dorje Nönpo. Tsogkhang Rinpoche, another great disciple of Dudjom Lingpa, visited Degyal Rinpoche and stayed with him for one year. At one moment, it is said that Degyal Rinpoche was invited by the local deity of Namkha Khyung Dzong,the Twelve Tenma Sisters and the Menmos, and that he accepted and moved to the south-west of Mount Kailash to settle in the “Dakinis secret crystal cave” where he accomplished a 3 years retreat. After this retreat, his followers increased gradually. He taught his students during summer, and have all of them in strict retreat during winters. Once, on the 25th day of the Tibetan month, he celebrated a great Tsok feast and, after its completion, he met his disciples one by one to give them instructions for their practice in seclusion during winter. He remained himself in retreat until the 10th day of the third Tibetan month of the following year. Then, in the fourth month called Saga Dawa, he organized a white Nyung-ne, which was followed by teachings of the Dudjom Tersar lineage, from the Ngöndro up to the instructions on Chö and Dzogchen. ”One winter, rainbow lights and a pleasant scent were noticed everywhere in the area. The disciples of Degyal Rinpoche asked him what was the cause of such wonderful signs. He answered that in a vision he had, he was Ananda and the Buddha Shakyamuni was in front of him. A that instant, as he was feeling an intense sadness, the lord Buddha became actually present and bestowed to him many instructions for 7 days. The other people couldn’t see anything but the outer manifestations in the surroundings”. Degyal Rinpoche’s fame spread far away throughout Tibet. For this reason, the 13th Dalai Lama choose him as one of his “Supporting teachers for longevity” and a governmental delegation used to come every year to pay homage and bring offerings to him. At the request of his disciples, Degyal Rinpoche wrote a substantial number of texts including many instructions and prayers all imbued by the flavor of Dzogchen. Yet, the centrepiece of his works is the Zungdzin Trulpa Rangdröl (gzung ‘dzin ‘khrul-pa rang drol ygud). This tantra is connetected to the Daknang Yeshe Drawa (dag snang ye-shes drwa-ba) terma cycle of Dudjom Lingpa, It is said that “this tantra was revealed to him by the Dakinis in his mind which was inseparable of Dudjom Lingpa’s mind”. Degyal Rinpoche transcribed the Zungdzin Trulpa Rangdröl in 1928 when he was 56 years old. His collected works were published in 1985 in Delhi by Tsokhang Choktrul Tsewang Dorje, son of Golok Serta Rinpoche. Khyungtrul Rinpoche Jikme Namkhai Dorje, aka Khyungpo Rinpoche, from Khyungpo. When he was 61 years old, in the water-bird years (1933), Degyal Rinpoche seemed to suffer of severe rheumatics during the Tenth day celebration of the 3rd Tibetan month. His disciples carried out rituals for his health and longevity and then, he seemed to feel better. ”At that instant, three white flowers fell at his feet and he dissolved his mind in Dharmadhatu, remaining three days in Tukdam. The sky was filled by iridescent lights and all kinds of rainbow clouds appeared above the teacher’s residence”. 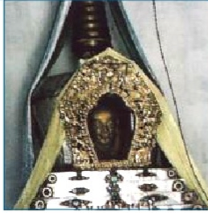 A reliquary stupa was built in Namkha Khyung Dzong by his disciples to keep the embalmed body of Degyal Rinpoche. Degyal Rinpoche's reincarnation, the Second Degyal Rinpoche, was born as the son of his heart disciple Golok Serta Rinpoche. ↑ Oral stories from Namkha Khyung Dzong practitioners. ↑ This learned and accomplished Bönpo teacher founded Gurugyam Monastery in Khyunglung valley, close to Mount Kailash. Thus, he revitalized the Yungdrung Bön tradition in this area but practised also the Nyingma teachings under the guidance of Degyal Rinpoche, especially the Tröma Nakmo cycle. This page was last edited on 12 March 2019, at 11:16.